Pratyāhāra, or “withdrawal of the senses,” is a vital practice the ancient sage Patanjali—author of the Yoga Sūtra, described as the fifth limb of aṣṭāṅga—the eight limbs of Yoga. 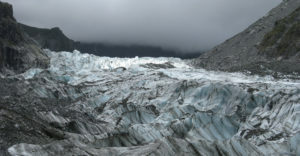 In this course, Dr. Welch and Dr. Robert Svoboda explore the theory and practice of pratyāhāra: it’s meaning and purpose, the awakening of awareness required to practice pratyāhāra, its relationship to the flow of prāṇa, and its relevance in our modern lives. The listener is invited to participate in the guided visualizations, chanting, and pratyāhāra practices employed throughout the course. While our Foundations of Āyurveda Part I and Foundations of Āyurveda Part II online courses are academic, intensive, and quite comprehensive, this course is not. It is a free-flow exploration and contemplation. Neither Dr. Svoboda nor Dr. Welch consider this course to be a systematic, comprehensive or academic introduction to Patanjali’s Yoga Sūtra or the fifth limb. However, there may be insights that even seasoned practitioners of yoga may find valuable, or that students or practitioners of Āyurveda may find helpful to support their exploration of knowledge or practice. 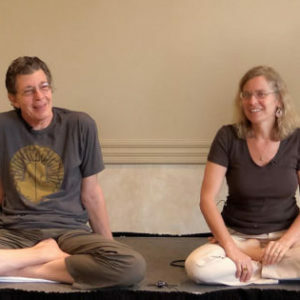 This roughly 9-hour course contains seven lessons, consisting of edited live, audio recordings of a weekend workshop presented by Dr. Robert Svoboda and Dr. Claudia Welch at The Ayurvedic Institute in Albuquerque, New Mexico in April, 2015. There are no assignments and no homework or texts required. If you are new to the principles of Eastern philosophy and spirituality, some of the vocabulary or concepts discussed but not defined in this course may be unfamiliar. But, with the aid of the internet, these can be defined and we think it is likely they will therefore not be an insurmountable obstacle in following this material. This audio course consists of seven lessons with a total of 9 recorded sessions, ranging in length from 49 minutes to 1 hour, 16 minutes. (They are not downloadable). 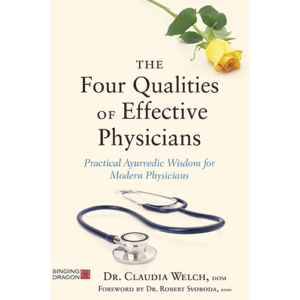 Each session includes lecture and discussion with both Dr. Welch and Dr. Svoboda, often in a lively and light-hearted exchange. Most sessions include one or more questions from participants of the live course with in-depth responses from one or both of the instructors. The listener may need to increase the volume when participants are speaking. Many sessions begin or end with some chanting. The chants are mainly from the Hindu tradition. It is not necessary to be a practicing Hindu to take this course. They are chanted out of respect to the traditions of Dr. Welch’s teachers of Ayurveda. It is unnecessary to chant them and perfectly fine to skip them if you feel uncomfortable chanting or listening to them. The listener is invited to participate in the guided visualizations and practices. It may be beneficial to turn off the recording during the silent portion of a practice, as long periods of silence have been removed from the recordings. Please note: Unintelligible speech and background noise have also been removed from recordings as much as possible, but these are live recordings, and therefore not studio quality. A 20-question quiz in included, to be taken upon completion of the material. Understand and list the four types of vāṇi (speech) as defined by Indian philosophy: vaikharī, madhyamā, paśyanti and parā. Anytime. This is a stand-alone, self-paced course. Start, stop, begin again, any time that is convenient for you. How long will it take me to complete the course & How long will I have access to it? There are approximately 9 hours of material on the 9 recordings. However, it may take longer to complete the course. We recommend you take your time with the material, reviewing sections that are either particularly meaningful for you or that are unclear with one listening. You will have access to the course for one year from the time you register. You can extend access to it for another year for 50% off the original price, or 50$ per extra month of access. If you have questions about course content as you go along and would like support, you can sign up for a tutoring option with one of our tutors. We also plan to offer two live Q&A calls per year with Drs. Welch and Svoboda, for alumni of our “Foundations of Ayurveda Part I“, “Part II” and, “The Planets” courses and post them on our Q&A page. Once you are a registered student of one of these courses, you will receive emails letting you know when live calls are scheduled, how to join them, and be invited to submit questions on course content. If you need technical support with the website or course, please contact our webmasters at Barn2 Media by emailing info@barn2.co.uk. Will we have live access to Dr. Welch or Dr. Svoboda? We plan to offer two live Q&A calls per year with Drs. Welch and Svoboda, for alumni of our “Foundations of Ayurveda Part I“, “Part II”, “The Planets,” and “pratyāhāra” courses and post them on our Q&A page. If you are not an alumnus of any of those courses, you are still welcome to listen to or share these sessions, but you may find them a bit confusing, as they relate to material covered in those courses. Are there any required textbooks? Yes, there is a quiz at the end of the course. They are not tricky questions. In fact, they are decidedly un-tricky. All quiz questions cover the stated objectives listed for each section. All passing grades are 80%. Can I have a certificate of completion? Yes. Once you have successfully completed the course and quiz, you will have the option to print out a certificate that will include your name, the name of this course and the number of course hours. Please download, save and print out your certificate before your access to the course expires. Even if you don’t want it now, you might want it later. If you don’t download your certificate before your access to the course expires, you can request it in the future but we may no longer have access to it and, even if we do, it takes some fiddling and time to get one for and to you, so there will be a $50 administration fee for this service. Does this course count towards educational requirements for becoming an Āyurvedic professional? 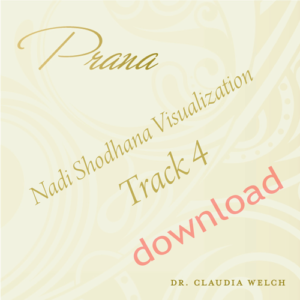 For information regarding this or NAMA considerations, please contact us at Office@DrClaudiaWelch.com with your specific question. 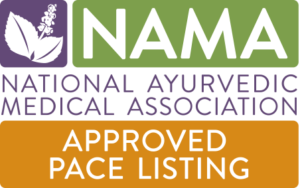 For more information about the NAMA defined professional levels, educational requirements, or NAMA requirements, please consult NAMA. Can I download the audio files? No. This is a streamable course and the platform we use does not allow downloads. I am already a NAMA-certified Āyurvedic professional. Can I get NAMA CEU credits (called, “PACE” credits) for this course or its individual lessons? Does this course fulfill the requirements for CEUs for licensed health care practitioners that are not Ayurvedic professionals? At this time we are not pre-approved CEU providers for health care professions other than the field of Āyurveda. However, you will have your certificate of completion, which will provide the title of the course, your name, and course hours. This may or may not be sufficient for the organization requiring your CEUs. We encourage you to contact your organization to determine what we could do to support you getting CEU credits for Dr. Welch’s programs. If there is additional documentation that you need, we’d be happy to support you with this for a nominal fee. What that nominal fee would be, depends on the documentation you would need. Please contact our office if you have any questions about this. How long is each individual lesson and how many credit hours will I receive? Because we have a small store and a small staff, we do not accept returns, nor do we offer refunds or credit for returned items. This includes our online courses. However, we have tried to give clear descriptions of the courses on the course pages available before purchase so, if you have questions about whether the course will be right for you, it might be good to carefully review that information and let us know if you have questions or concerns before you register for the course. Is there an option for financing? Yes. US residents can use the PayPal finance option to pay, when you purchase the course. The PayPal finance option has 0 payments and 0 interest if you pay within 6 months (subject to PayPal credit approval). Beyond 6 months, there would be a 19.99 % interest rate. To choose this option, when you go through the checkout line you will reach the PayPal page where you can choose to pay via your own credit card, via your PayPal account, or via PayPal Credit. Choose PayPal credit. If you haven’t done this before, PayPal will ask some questions to check your credit before approving. Once approved, your transaction will go through and you will have access to the course without needing to pay anything for 6 months. However, to get the zero-interest rate, please remember to pay what you can at the end of the 6 months. If you are outside the US and would like to know a different financing option, feel free to contact us.